❤ Size: height-23cm/9.1in, bottom diameter-14.5cm/5.7in, lid diameter-9.1cm/3.6in. ❤ Feature: Anti-drip spout for easy pour,lid close tightly without falling off when pouring. ❤ Function：Perfect for water,milk,coffee,ice tea,juice, wine and beverages. Why choose Suteas Glass Water Pitchers? √ Large Capacity to serve your family for daily use or entertain guests at the party. √ Two way of water outlet: small filter hole & big opening, rotating the lid can choose your convenient water outlet. √ Anti-drip spout & big top diameter: convenient to use and easy to clean. √ Stainless Steel lid with baby & medical safe rubber ring: close tightly, it won't fall off when pouring. √ Thickened borosilicate glass: BPA & Lead free. -20°C ~ 150°C/-4°F~302°F Safe. More durable than other glass. √ Wash Easily: Big mouth on the top makes it easy to clean the inside. Dishwasher-safe, but hand-wash recommended for glass carafe. √ Well Packaged: A wonderful gift for Christmas, Easter, Halloween, Thanksgiving Day, Mother's Day, Father's Day and Other Holidays. ❤ Any deficits upon receiving suteas carafes, please kindly contact us. We will ship a new one to you immediately. ❤ Any problems when using, please kindly contact us. We will help solve your issues or ship a new one to you immediately. ❤ Any unsatisfied points about suteas jugs, please just contact us. We are always here to help you. 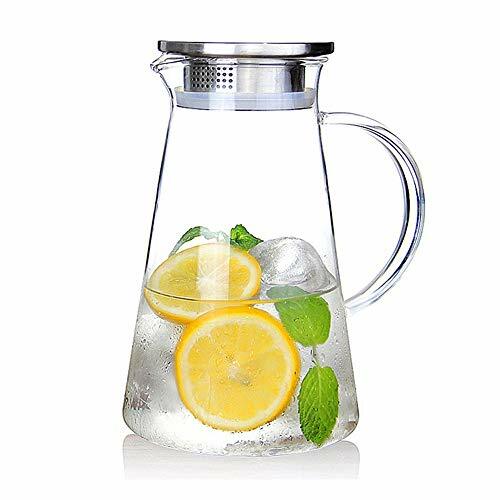 ☆【Superior Heat-resistant Borosilicate Glass Pitcher】 BPA free & lead free,durable,refrigerator safe & stovetop safe,withstand temperature -20°C ~150°C/-4°F~302°F. So it is ok for you to put it in your fridge or boil it on the stove. ☆【SUS304 Stainless Steel Lid】 Anti-drip spout,Convenient to pour and easy to clean. The handle is big and comfortable to hold. Baby safe & Medical safe rubber part arround the lid makes the lid close tightly, keeping the water inside fresh and the lid not falling off when pouring. ☆【Large Capacity】2000ml/70oz, large enough to serve your family for daily drink or entertain guests at the party. Size: height-23cm/9.1in, bottom diameter-14.5cm/5.7in, lid diameter-9.1cm/3.6in. Fits well in most fridges. Perfect to prepare and serve cold or hot beverages, water, wine, coffee, iced tea, fruit infused juices. ☆【Handcrafted by Craftsman】 The pitcher is hand blown true borosilicate glass with graceful modern lines by professional craftsman. ☆【Wash Easily】Dishwasher safe, but hand wash is recommended. Big mouth on the top can let your hand reach the bottom easily,making the inside cleaning become very convenient and easy. If you have any questions about this product by Susteas, contact us by completing and submitting the form below. If you are looking for a specif part number, please include it with your message.